PopMatters premieres The Runaround, the second album by up-and-coming Austin band Wild Child. 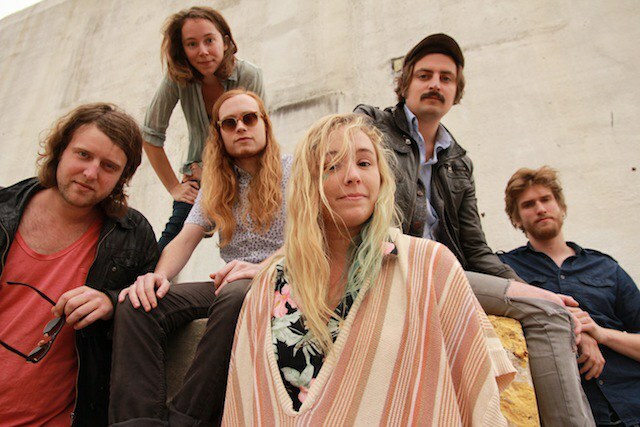 For a band that exudes such familiar, tried-and-true qualities as rootsy folk charm and an irrepressible pop spirit, up-and-coming Austin-based outfit Wild Child is surprisingly hard to classify. On its upcoming second album The Runaround, which premieres here on PopMatters, Wild Child eludes any easy classification, more organic and earthy than indie-pop typically is, but also richer and more effervescently poppy than what you'd associate with folk or Americana. With the release of The Runaround on the horizon, PopMatters checked in with Wild Child's primary songwriters Alexander Beggins and Kelsey Wilson to find out how the group has developed since its 2010 debut Pillow Talk, how Ben Kweller lobbied to produce of the new album, and how the band's music ended up on a Purina cat food ad. Wild Child's The Runaround comes out on 8 October via The Noise Company. PopMatters: There's a warm, familiar tone to your music, yet its sound is hard to pin down and categorize. Your approach seems more rootsy than indie rock tends to be, but also more poppy and fleshed out than the folk tag implies. How would you describe your own music? And does finding an easy way to categorize it matter to you? Alexander Beggins: In short, no, we do not feel like categorizing our music is important whatsoever. When we started the project, we never sat down and decided hey...let's make our band sound like this...or we should try and write a song like so and so. We write songs for ourselves. We have a banjo, so people say we are folk, and the term indie is thrown around so loosely that I don't really even know what it means, but it does sound cool, I guess? We had a running studio joke where we were categorizing our new album as "Alohahop". Hawaiian hip-hop, baby. PopMatters: One thing that stands out about The Runaround is how organically all the parts come together, especially the way the girl-boy vocals intertwine with one another. Is that give-and-take something that comes naturally to you or is it something that's developed out of practice and working together more? Alexander Beggins: We spent way more time with pre-studio production for The Runaround than the actual writing of the framework of these songs. Writing for Kelsey and I is extremely organic and kind of always just finds a way to easily come out. We only write when we feel like it and are inspired to do so. Writing has always been a release for us and so it has never felt forced. The entire band, all seven of us, worked extremely hard to make the arrangements feel big and natural. Ben Kweller, our producer, ready had a knack for helping us make everything flow naturally on the album. We're all a really great team. PopMatters: Your press release describes how you felt your debut Pillow Talk was a "work in progress". The Runaround, obviously, doesn't feel that way, so what are some of the changes Wild Child has undergone in between the two albums? Is it simply the case of getting more experience under your collective belt or is there something more than the natural maturation process to Wild Child's growth as a band? Kelsey Wilson: With Pillow Talk, we essentially had no idea what we were doing. We were naïve songwriters who really wanted to make an album, so we got our friends and family together to help out. We also weren't very practiced as a live band. After the successes of Pillow Talk, we started playing and traveling more. We got better with every show and started to realize what we wanted to do with our next record as we got to play the songs live. Big and better. We went into the studio with a really good idea of what we wanted it to come out like. We still have a lot more growing to do, but we feel like we are maturing as artists everyday. It's exciting times. PopMatters: As you noted, Ben Kweller produced The Runaround -- how did that relationship come about? What was the experience of working with him like? Kelsey Wilson: I remember Ben leaving us a voicemail saying that he had heard Pillow Talk and loved it and wanted us to "drop his name in the hat" for being our potential producer. We met up at a bar and chatted for a couple hours and jammed the demo songs in his car. After that night, we knew it was a perfect fit. He's one of the most positive people you will ever meet and was very encouraging in the studio. We respect him as an artist and let him into the Wild Child family. We've had a lot of laughs along the way. PopMatters: One of your songs ended up soundtracking a Purina cat food commercial. How did that come about and do you run into folks -- cats, included -- who recognize you from it? Alexander Beggins: Commercials are a great way for musicians to make money and pay rent these days. Our wonderful manager Pat Cassidy does his best to present us with opportunities like this. This one just all worked out and we were so stoked it did! We got a lot of new fans who discovered us on that commercial. Also, for fans that already knew who we were, it was fun hearing stories about how they heard it in the background and just KNEW it was us. Our cat Beemo hates it, but what does she know? PopMatters: With the end of 2013 upon us, what are some of your favorite albums, artists, or musical experiences from this year? And what do you have planned for the rest of this year and for 2014? Alexander Beggins: We got to go out on tour with our good friends Shakey Graves and the Marmalakes. It was a crew of 20 close friends and all the shows were a total blast. It was an incredible summer. 2014 is going to be a road year for us. We are going to be traveling all around the country and try and break into other continents as well. We'll always make time for whiskey, as any good band should do.